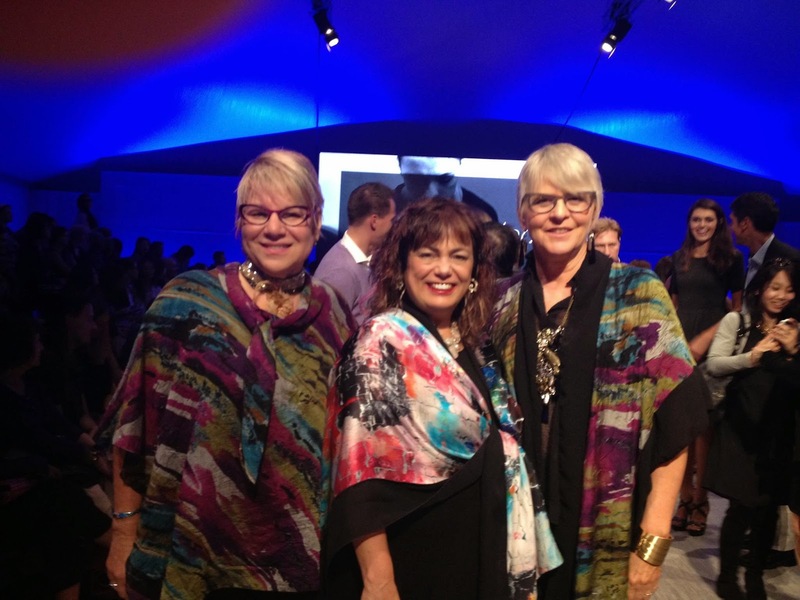 Randi Winter & I wearing our K-O.ME wear. Designer Kjaer Neletia Pedersen is in the middle. 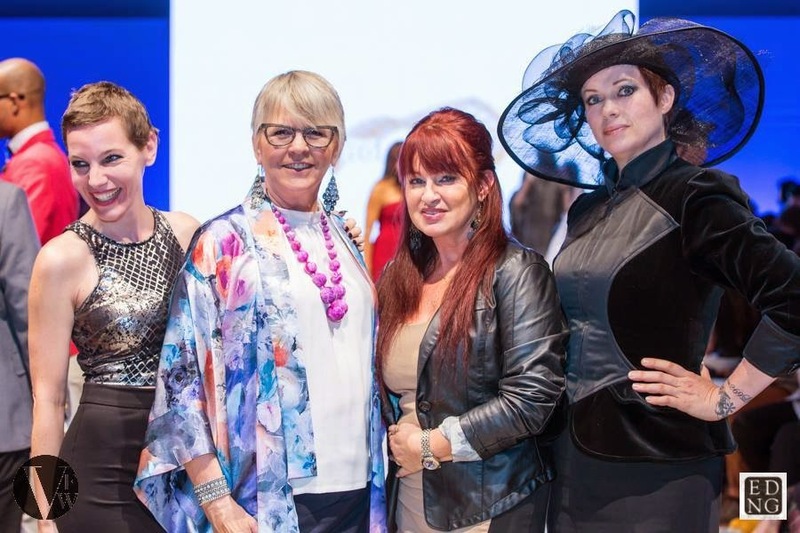 We are now into day 4 of shows at Vancouver Fashion Week (VFW). For those of us trying to be in our seats for every show on every day, we're starting to wear thin. I can only assume the myriad of volunteers are feeling the same way. So this was the day I chose to dub my seasonal "Volunteer Appreciation Day." What that means is I show up with treats for all those wonderful people who make the event special and treat me so well, but don't get to walk the runway and be seen in the media. This group includes the entire hair/make-up team, those working the front door, the people awaiting you on entrance at the check in tables, those seating us on the runway, dressers, a group of lovely ladies working in the media room and more. There is a whole team behind the scenes that for the most part don't get a lot of kudos. This was my day to officially thank them. As they didn't eat all the treats I brought, I shared the rest with the photographers who help me with images and others sitting through all the shows that are slowly tiring. The sugar rush gave them all a pop of energy. 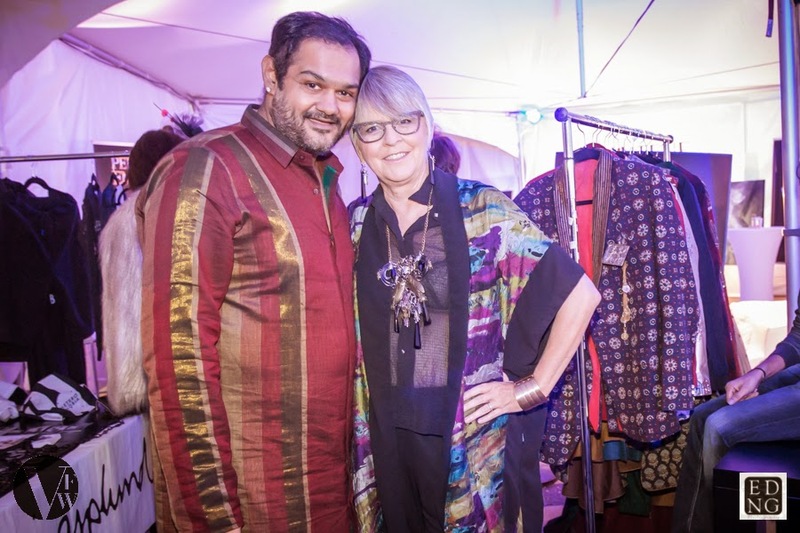 My outfit today in the image with Shravan includes a beautiful caftan by K-O.ME designer Kjaer Neletia Pedersen. The sheer black top is by RozeMerie Cuevas of JAC. Grey metal frames from Sue Randhawa at The Optical Boutique. Necklace and earrings by Carolyn Bruce. The lovely bracelet I am wearing was a gift from Shravan. Love this image by Ed Ng with designer Shravan. It took some real time to decide today who to cover as there were quite a few really interesting shows. Four can be a limiting number, but it's truly all I can write and get a post up by noon the next day - so enjoy and be sure and check out the other amazing shows. I love seeing menswear on the runway and add in that it was made in Italy - well just a great combination and wonderful way to open the days shows. Milanese designer Andrea Lazzari has titled this collection, "Aquarium". My excerpt here is compiled from 2 different sources - the VFW bio and an online bio at Not Just a Label - "His Idea of Fashion tries to propose a seasonal product that seeks to identify the symptom of progress and the trend of Man Co-Adviser in the future, without giving up a classical ideal. In him there is a combination of world-formal and informal, between classical and experimental...Summed up in a ' unique essence of the characters Minimalism , Concept Design and Cleaning , shaping a new stereotype of Man between formal and informal , between Experimental and Classic . 'Elegance has no limits.'" The opening look in blue and white really caught my eye in particular and that set the tone for the whole show. This collection showcased clean, beautifully tailored menswear with a very modern feel. It was subtly elegant, a note not always easy to hit, but one that gives the collection a much wider range in terms of wear. I was very drawn to the beautiful blue shade used with white in the prints in particular. Around me were others drawn to the dark jackets. A great opening show to a start of the evening and one that was a definite hit with the audience. I love variety on the runway, especially as I up to 10 shows a day this week and vegan designer Renata Buzzo from Sao Paulo definitely made me sit up and take notice. Here is a little information from her VFW bio - "Renata Buzzo is a fashion graduate of Facultade Santa Marcelina. She is a devout vegan, passionate about animals, books and vintage film. She likes to immerse herself in the world of thrift and consignment, where she completely looses track of time. As an unconditional fan of history and the antique, she prefers custom-made as a way to produce garments; her favorite fashion technique is moulage draping. In the pursuit of her dream career, she combined all her passions together to create a unique concept for her brand. And it worked!" The collection was all white which meant the audience was given the opportunity to fully embrace the garments in a different way. It was about experiencing the unique silhouettes, different ways of using volume and drape, textural elements created in many different ways - gathering, ruffles, shredding, applique - and subtle sparkle added oh so discreetly. The collection over all exuded a soft, ethereal and feminine addition to the evenings show that charmed the women in particular. My favourite? The closeup above, second from the right. Love the way volume, texture and sheer played out and I think this dress was on just the right model as well. Just all came together for me. I really embraced the sheer fun of this collection. Some pieces were definitely more wearable than others, but the white, vivid orange and royal blue palette combined with 3D elements and surprising textural shag leg on a few of the shorts were just exuberant. The styling, the makeup (some eyebrows were highlighted orange), the hair and the striped sandals all pulled this show together seamlessly. Kudos to designer Clara Martin. Everyone sat up. Everyone had a smile on their face. You caught our attention and we are hoping to see you return next season! Ending the evening with beautiful womenswear by a designer from Paris - what would be better? Only 20 years old, designer Laura Naval is well on her way to making a name in the industry. From her VFW bio - "Born in Paris, France, Laura Laval grew up in an artistic household, and was encouraged to pursue her talent by her parents, both artists. She soon realized that she was fascinated by the process of manual work, especially work related to crafting fashion. After finishing high school, Laura attended a fashion school to become well versed in haute-couture and fashion design. Once graduated, Laura moved to Paris to start her own label and begin creating her own collections. She went on to receive the “Young Parisian Designers” award, was published in Vogue Italy and featured on Fashion TV." Anchored by black and white, the collection offered a range of solids, lace and sheers created in a range of dresses and separates. The 2 looks on the left above have bodices created from woven fabric. The mix of solids with sheers and the designer's use of applique took garments from simple to striking. In the end, I think my favourite looks were the sheer tops with pants on the left above. The back with the solid pant top and sheer legs is exquisite. I could see that worn at a high end evening. The solid woven white pants with white sheer top is still elegant, but the solid pant fabric gives the overall look a little more range in terms of the events it could be worn at.